We had a family wedding on Saturday, held at a lovely cottage in Victoria Harbour. Family and friends helped cater a buffet, and after dinner coffee was provided by Tim Hortons. 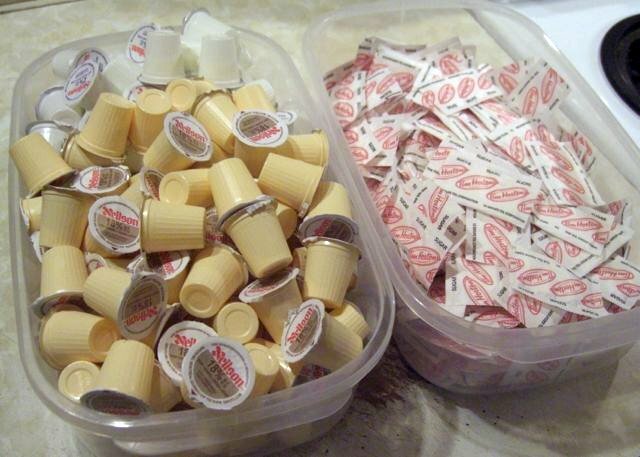 The awesome thing I learned about getting Timmies coffee catered in, is that there are loads of creamer, milk, and sugar leftovers. Which are all now in my house. Awesome. Coffee is going to taste even better for the next little while. My usual coffee has whitener or milk, and on those rare occasions I use cream, I use the 5% kind. This stuff is 18% and it's adding some yummy bliss to my mornings. That would be a great find for me. I use powered creamer in my coffee at home. Enjoy!! Thanks! Don't know how I'll go back after all this cream! lol! Not too bad, a touch of almond or vanilla essence/extract and I'd be good to go.